Entering an export market may seem complex and scary, but it is a straightforward process so long as you identify the key decisions to be made and the order you need to make them. We have created a chart to guide you through the process. It outlines the framework and looks at the main steps and milestones you need to consider. It is not exhaustive and only deals with the fundamental decisions such as selecting a market, choosing a route to market and considering the marketing mix. Think of it as a basic route map to get from A to B, then you can put in all the specific details to tailor to your business. 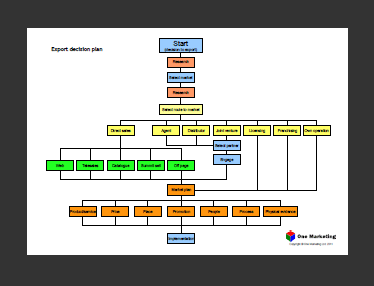 Download the free export decision framework chart PDF here. Don’t forget our export-specific planning cards.